Another Graduation after six months of hard work and personal growth. desire for a better future. Click here to see individual pictures of each graduate! Recovery Program, Hogar RESA, to Grace Place. in Sebring as another home for their program. Grace Place is finally complete and ready for occupancy. Click here to download the digital version of our latest news letter. flowers on the porch. It is the perfect finishing touch. News Sun recently featured an article about Grace Place. Click the link to read about Grace Place and the founders, John and Eileen Sala. August News Letter now available online! Click here to download our digital news letter for August 2011. Our Grace Park being put in place to create a spiritual setting for our girls. An ideal setting to contemplate the majesty of God. July News Letter now available! Click here to download a digital version of our July News Letter. Carl is a dedicated Christian man who disciples other men in the prison at Avon Park Correctional Institution, where also serves as the Chapel clerk. He is a graduate of the Overcomers class and now a recent graduate of the Marriage, Family, and Parenting class. Some of our proud Graduates in the Chapel at Avon Park Correctional Institution. Click here to see group pictures of the graduates of the Overcomers class and Marriage, Family, and Parenting class. Sitting for the Marriage, Family & Parenting exam at Little Lambs. Here is a view of the new office at Grace Place! A view of one of the bedrooms at Grace Place, in progress! into Grace Place this week. Lots of love and concern from all the sponsors. 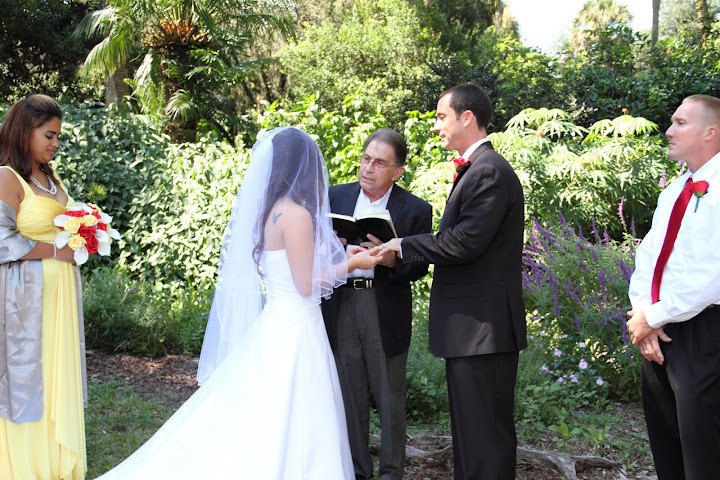 Holiday Wishes to All of You from Little Lambs Inc.
A Wedding at the Bok Tower for a student. Overcomers Addiction Recovery Class at Avon Park Prison. Marriage, Family, and Parenting Class at Avon Park Prison. Congratulations to all these men for their hard work and dedication. Sebring Cabinets to the Rescue! with Wayne delivering our oak cabinets. we're waiting on the countertop!! home. The floors have been prepped and Ray is ready to tile. As you can see, it will take a lot of work, but is certainly worth it! More pictures to come as the cleaning continues! Saturday : First coat of paint ! the weekend to paint the interior of A Safe Place. Below you can see Greg painting the walls and ceilings. He was finished in a matter of hours and then off to another job! Many thanks to Greg for the gift of his time and expertise. Also many thanks to Sherwin Williams for the donation of paint! The plumbing fixtures have arrived! cabinets, faucets, toilets, showers, and garbage disposal. for such a generous donation! August News Letter Available for Download! Click here to download Little Lamb's August news letter! many volunteers, the walls are complete! Some of our new staff having a look at the new space. Thanks to everyone who pitched in to get all the 12 foot wallboard in place. Here you can see the cut-out window between the kitchen and dining areas. This space is evolving everyday. It is truly amazing to see how much progress can happen with hard work and dedication. Many thanks to those who continue to offer their support for this project. and scouring for resources among the group. Tim volunteered with us for over a week. He is a professional drywall and painting contractor. Tim is an old friend of the ministry and we are so grateful for his help with those 12 foot ceilings! Now we are ready to begin the finishing. Little Lambs Inc. has just joined Facebook! Check out our facebook page for updates on A Safe Place and Little Lambs Prison Ministry. Our goal is to share information and photos about our current projects and keep you informed on our progress. Feel free to comment or ask questions. We still are adjusting to online life, but will try to address all question and concerns in a timely manner. 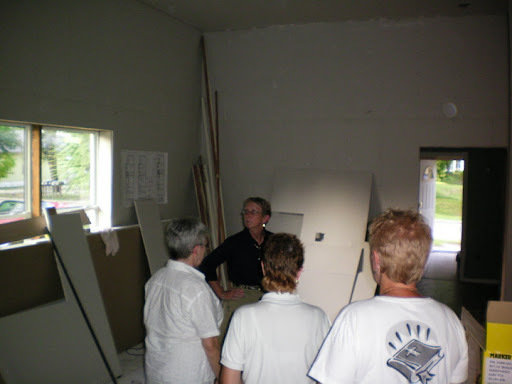 to set up the wallboard in A Safe Place. Amazing work in so little time! 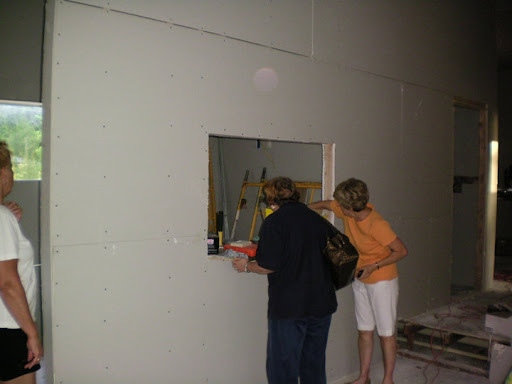 The inside of the walls have been covered with scripture verses and new now have wallboard installed over the top. Insulation was also put into the walls as well. We hope to complete the wallboard by the end of the week. 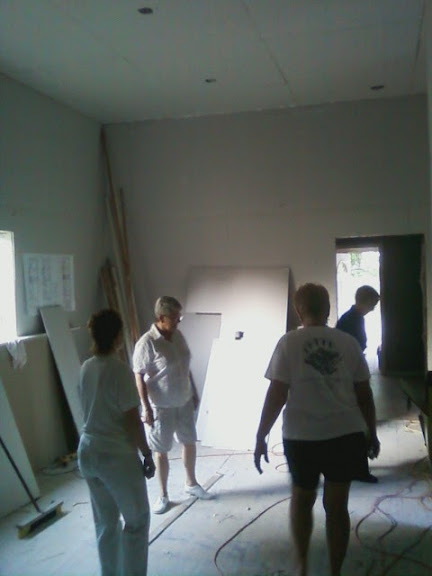 Another crew of 4 local volunteers came in to do the ceilings. Our ceilings are 12 feet high, just a little harder to do. Big thanks to all these guys who gave up their time so near the holiday weekend to help keep us on schedule... T H A N K Y O U ! 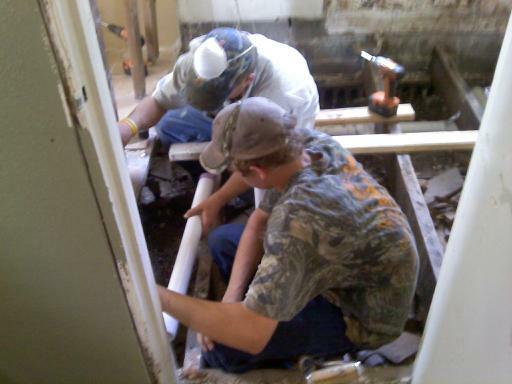 A Safe Place Update: PLUMBING IS IN ! all the plumbing for the 5 bathrooms at A Safe Place! bathrooms. We now have 3 shower stalls and 5 toilets installed. drug screening and other office necessities. This gives us adequate facilities for guests, staff, and the 10 women to be housed. life and future for themselves and their families. 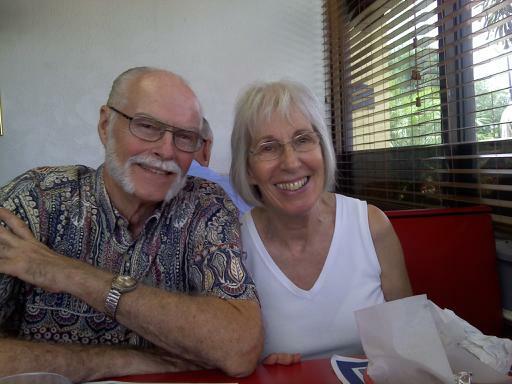 Jackie and Gerald Speirenburg from Sarasota, FL came to Sebring on May 2nd to wire A Safe Place for us. They are my heroes! It was the first heat wave of the year with temperatures in the 90's. They were here on a mission and doing a work for the Lord, they said; and work they did. Working 10 hour days, for 15 days, with only one day off! Gerald is a journeyman electrician from Michigan and Jackie is his very efficient and detailed helper. They acted like they were in their 40's, not 70's. They did some very complex work for us and made us inspection-ready. We estimate that they did over $10,000 of work and refused pay. 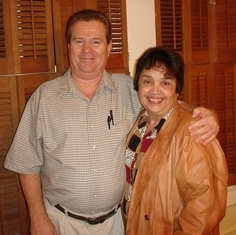 They are a very interesting couple with a very varied history. They have been serving the Lord for 55 years. They are tremendous role models and it was our pleasure to have them with us. Welcome the newest member of Little Lambs Inc.
We are so pleased to introduce you to Helen Bingenheimer, our new Community Liason. She will be helping us get the word out for the newest part of our ministry, A Safe Place, Home for Women. Helen comes to us from Frostproof, and is president of a large Christian Women's Organization in the Sebring area. She will be joining us at the Little Lambs office. 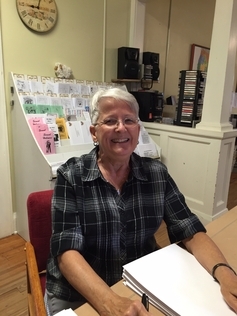 Helen's main function is to help draw support and spread the word about A Safe Place. With Helen's help people will learn more details about this project and how they can help. We know that to make this project successful and sustainable we will need support from the community. A Safe Place, our new building on Magnolia St., is a concrete block house built in 1930. Our focus this week was framing new walls. The 12 foot ceilings and concrete walls make this quite a hefty job. We were in need of a pneumatic coil nailer for the concrete walls and framing. Timidly, we went out at 7 am and purchased the expensive nailer and compressor. 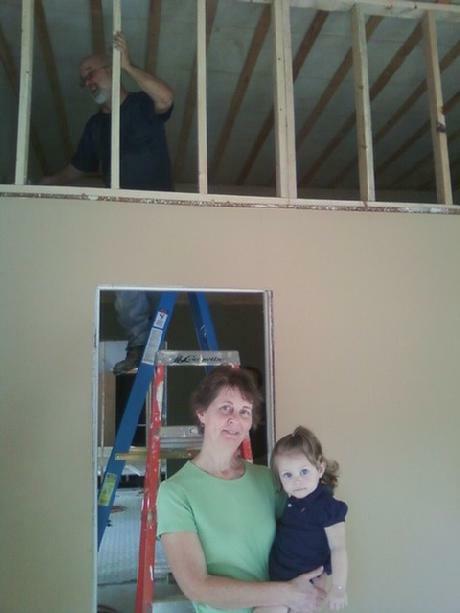 By 10 am our guys were nailing away and framing walls, when Linda Boyd and her 18 month old granddaughter stopped by and brought us a gift. That gift paid for the nailer, the compressor, hoses, and a case of nails. What a blessing - Thank you Linda! Many thanks to all those who are working to help us on this project, you are greatly appreciated! 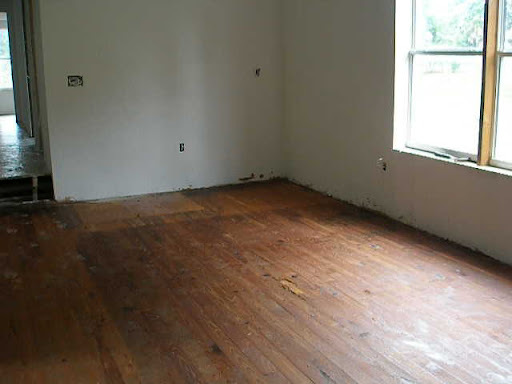 The transformation has begun, keep checking back here for more progress reports on A Safe Place. Easter was an awesome day for us. 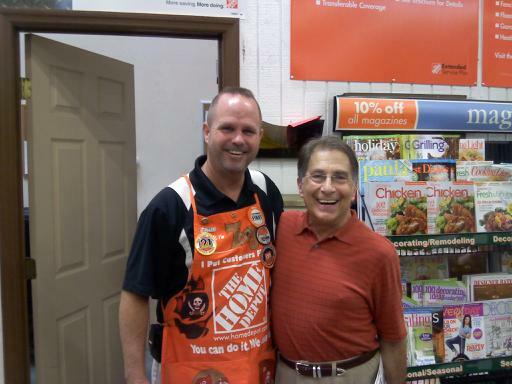 On Saturday, we received a call from Jon in Winter Haven, he wanted to share his story with us. Nine years ago, he was in a West Virginia prison after 20 arrests, and at the end of his rope, hopeless. There he read John's book (I'm Not Coming Back), and said that it gave him hope and he turned to the Lord. 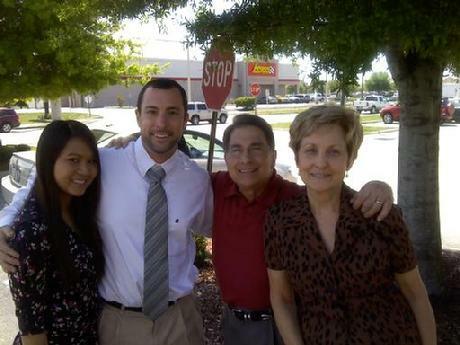 After making parole Jon is with family in Florida, where he is nearly finished with a Master's Degree in Business Administration! He called to talk with John and mentioned that he wanted to spend Easter with us, that it was important to him. Jon brought his fiancé, Lisa. We went to church together for an awesome service, and then had lunch together. We felt like proud parents! We plan on seeing lots more of them. I was doubly blessed because Sunday was my birthday also! I look forward to a special spiritual blessing on my birthday, and I was not disappointed. April 1, Look for a link to our new digital newsletter on our website. God is leading volunteers for administrative positions and fundraising on A Safe Place. The permit is pulled, the power on, and the work beginning. Please pray as we move forward. 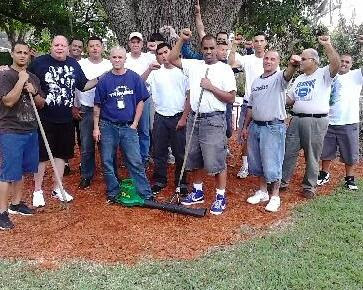 Monday we will start new classes at Martin Correctional Institution in Indiantown, Fl. The men have been invited to attend the Overcomers Class and the Parenting Class. Also starting in April we will begin new classes at Avon Park Prison. We expect to see great changes in these men. the new Little Lambs Inc. website! new photos, and progress on all our current outreach projects. and our needs to make this project a success. time, or funding. Every gift helps! questions or concerns about this website.